your loaves look amazing! I would love to have tea with you and your girls :) Thanks for sharing the recipe - I might just try it! these are beautiful. I love it when tradition dictates that certain things must be made at certain times of year...the girls will grow up to appreciate that even more, I know. ooh, you have me anticipating, Cheryl! wow, that's surprisingly similar to panettone (tre traditional Italian cake) - it must be delicious! Those are some gorgeous loaves! I love how tall they rose =D. I'm just curious as to how you cut the loaves...as tall wedges or round slices? We like to cut them as rounds in this house, with the top ripped off like a muffin top and slathered in butter! 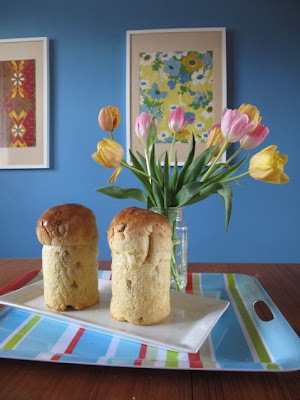 Three times to rise gives these loaves plenty of loft. I wish we were there so the girls could share with their cousin as he would LOVE the bread. I have officially cut ties with yeast so the poor kid will never get home-made bread unless he visits his auntie (or his grandma A)! 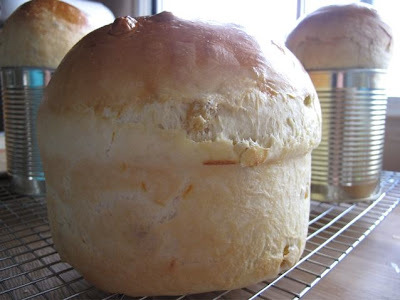 Hat's off to you Cheryl, for both this spectacular loaf and for including the girls in the process. I know that was never an option for you. 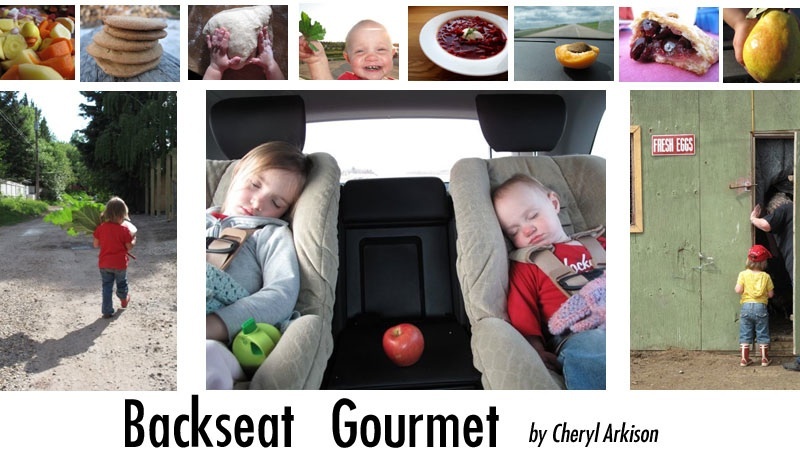 You're a naptime quilter, not a naptime baker! What size are your cans? I think I'll try this on the weekend. My baba would be impressed. 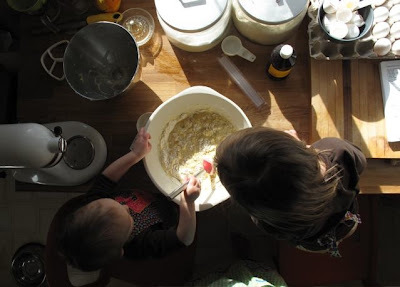 Bread is one of the best activities with the girls, you do all the work before naptime and then you have the post-nap snack! missweb, I used the 19 ounce cans, but it really doesn't matter what size. 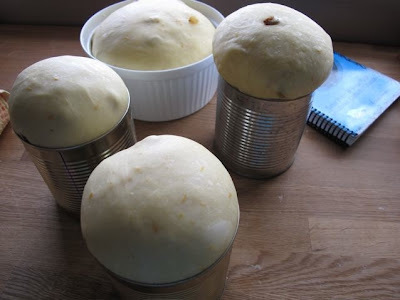 Just remember to only fill the can 1/3 full with dough before the last rising. Yummo-licious!!! Thanks for the introduction to Babka. I think I will try this with the boys this week. Oh I can just imagine the hot steam rising once you take the top off! I want them now!!! Do you serve them with Easter Dinner or as a brunch meal? Beautiful! Love how the kids are involved too. I love those tall breads. Beautiful! If the reduced version made all that bread, it's scary to thing how much the full version would make! A word of caution about the cans, I've been looking for cans to bake in and have found that lots of cans now have a white plastic lining. It's toxic for baking, so steer clear of those! These look amazing. I love rich eggy bread! Nice tulips too! 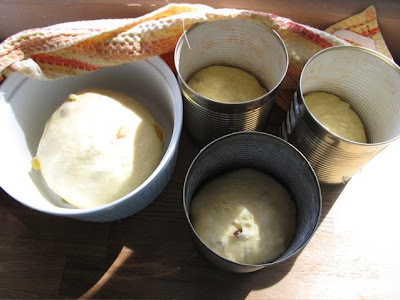 My great grandmother used to always bake her bread (a simple whole wheat) in old coffee tins. 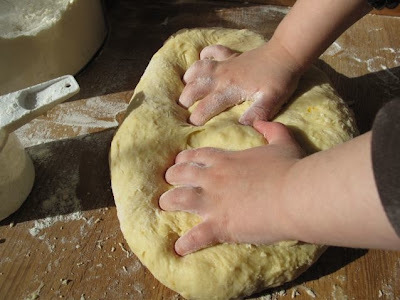 We called it "round bread." Love that last picture, spectacular loaves!! Very very cool. I've never tried a recipe like this and now I'm inspired to give it a go!